employee theft! Cashless ticketing removes unwanted partners from the revenue distribution stream and improves the bottom line. Increased Revenue – The system eliminates employee theft, and increases per capita spending as it offers increased value to patrons. The system is very customer friendly for patrons while creating efficiencies for managers and staff. achieved at rides and attractions. 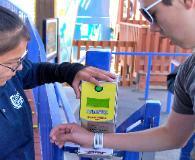 Park-wide application including rides, games, food, beverage and retail sales all on one card. discount coupons) and flexibility to give more value at special times to hold a crowd in the park. The system up sells itself through the offering of better value deals. your management team to gain optimal results. Click here to download a CORE Cashless Brochure.